Reid Health was one of 293 hospitals in the United States and only 13 in Indiana to receive a five-star rating from the Centers for Medicare & Medicaid Services (CMS) in a release of data. CMS released its Overall Hospital Quality Star Ratings in February, reporting on measures from more than 4,500 hospitals. Star ratings range from one to five, with the majority falling in the three- and four-star range. The Reid Health Breast Center has been granted a three-year, full accreditation designation by the National Accreditation Program for Breast Centers (NAPBC), a program administered by the American College of Surgeons. Accreditation by the NAPBC is only given to centers that have voluntarily committed to provide the highest level of quality breast care and undergo a rigorous evaluation process and performance review. The Reid Health Breast Center is one of 19 in Indiana with the accreditation. VisionFirst again recognized the Reid Health team with its “Vision” award for “exemplary leadership and commitment to its donor program and the community they serve,” said Alex Van Zant, Director of Professional Services with VisionFirst. VisionFirst was founded by the Lions of Indiana. Reid Health cornea donations made a difference in the lives of more than 100 people in 2017, he said, and approximately 450 in the past five years. Reid Health’s laboratory has again received a two-year accreditation by the Accreditation Committee of the College of American Pathologists (CAP). The award was based on results of a recent on-site inspection as part of the CAP’s Accreditation Programs, and included an assessment of the lab staff’s qualifications, equipment, facilities, safety program and record, and overall management. Reid Health recognized as one of only four hospital systems in the Indianapolis area and one of 14 in the state as among the top in the nation for organ donor awareness by the U.S. Department of Health and Human Services. The award is the nation’s highest for success in promoting organ, tissue and eye donation and transplantation services. Reid Health was recognized by the National Safe Sleep Hospital Certification Program as a Gold Safe Sleep Champion for a commitment to best practices and education on infant safe sleep. Reid was among the first hospitals in Indiana to receive the title. The National Safe Sleep Hospital Certification Program was created by Cribs for Kids®, a Pittsburgh-based organization dedicated to preventing infant sleep-related deaths due to accidental suffocation. In addition to being Cribs for Kids® partners, Reid Health was recognized for following the safe sleep guidelines recommended by the American Academy of Pediatrics (AAP), and providing training programs for parents, staff and the community. Community outreach includes educational classes for expectant parents and family members. Reid Health School of Radiologic Technology was given the maximum eight-year accreditation by the Joint Review committee on Education in Radiologic Technology (JRCERT). Reid Home Health, formerly known as Reid ANC, has been named a Top Agency of the 2017 HomeCare Elite®, a recognition of the top-performing home health agencies in the United States. This is the sixth year Reid Home Health has been recognized as Elite. For 12 years, HomeCare Elite has annually identified the top 25 percent of Medicare-certified agencies and highlighted the top 100 and top 500 agencies overall. The ranking is developed by ABILITY® Network, a leading information technology company helping providers and payers simplify the administrative and clinical complexities of healthcare; and sponsored by DecisionHealth, publisher of Home Health Line and the Complete Home Health ICD-10-CM Diagnosis Coding Manual. Reid Health’s Community Benefit program was recognized for its donations to Hayes Arboretum. The award was established in 2016 to recognize special donors and is the result of grant approvals to support the Arboretum’s Outdoor Playscape, a family friendly space with areas to explore, play and connect with nature. Reid Health has been verified as a Level III Trauma Center by a special committee of the American College of Surgeons. The recognition, by the Verification Review Committee of the Committee on Trauma, recognizes a center’s dedication to providing optimal care for injured patients. It also represents more than three years of work by the trauma team for this voluntary recognition. Reid Health’s emergency trauma center becomes the eighth Level III verified center in the state. The Reid Health School of Radiologic Technology received maximum of eight-year accreditation by the Joint Review Committee on Education in Radiologic Technology (JRCERT). The Reid Health Sleep Disorders Center received program accreditation from the American Academy of Sleep Medicine (AASM) To receive accreditation, a sleep center must meet or exceed all standards for professional health care as designated by the AASM. These standards address core areas such as personnel, facility and equipment, policies and procedures, data acquisition, patient care, and quality assurance. Additionally, the sleep center’s goals must be clearly stated and include plans for positively affecting the quality of medical care in the community it serves. Reid has again been recognized as one of the nation’s “Most Wired Hospitals,” according to results of the 19th annual HealthCare’s Most Wired™ in a study released this month by the American Hospital Association’s Health Forum. This is the fourth year in a row and the tenth time Reid has received the recognition, which highlights the use of technology to connect care providers and patients and provide the highest quality of care by integrating information to improve care. Reid Health was recognized with “Platinum Status” by the Indiana Donor Network for 2016 and ongoing efforts to raise awareness in the workplace to promote organ donation. 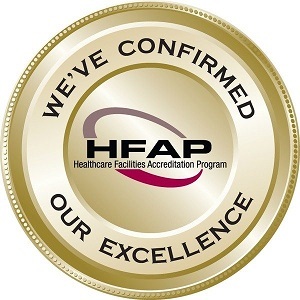 Reid Health received a full three-year accreditation from the Healthcare Facilities Accreditation Program (HFAP). The survey involves an extensive on-site review of quality and safety standards, including the overall environment of care. The accreditation is regularly sought and obtained by Reid Health, which has been accreditation by HFAP for 15 years and going through five surveys. Reid Health’s Family Birthing Center ranked above both the national and state averages in the Center for Disease Control (CDC) Maternity Practices in Infant Nutrition and Care (mPINC) Survey of infant feeding practices in maternity care settings. Reid Health received a 92 in the Benchmark Report, putting it above the average of 85 for the nation and 86 for Indiana. All facilities in the United States and U.S. territories are able to participate in the voluntary survey, which reviews things such as skin-to-skin contact, breastfeeding and other similar information related to infant health. Most Wired Hospitals: For the 10th time, Reid has again been recognized as one of the nation’s “Most Wired Hospitals,” according to results of the 19th annual HealthCare’s Most Wired™ in a study released by the American Hospital Association’s Health Forum.